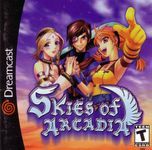 "Skies of Arcadia, released in Japan as Eternal Arcadia (エターナルアルカディア, Etānaru Arukadia), is a console role-playing game developed by Overworks for the Dreamcast and published by Sega in 2000. Skies of Arcadia Legends, a port, was released for the GameCube in 2002. Legends was also in development for the PlayStation 2; however, it was canceled shortly before the GameCube release. The game was also scheduled for a Windows PC release in Japan in 2004, although this port was subsequently canceled as well.The game's story focuses around Vyse, a young pirate in a Jules Verne-inspired fantasy world, and his friends as they attempt to stop the Valuan Empire from reviving ancient weapons with the potential to destroy the world." Source: Wikipedia, "Skies_Of_Arcadia," available under the CC-BY-SA License.